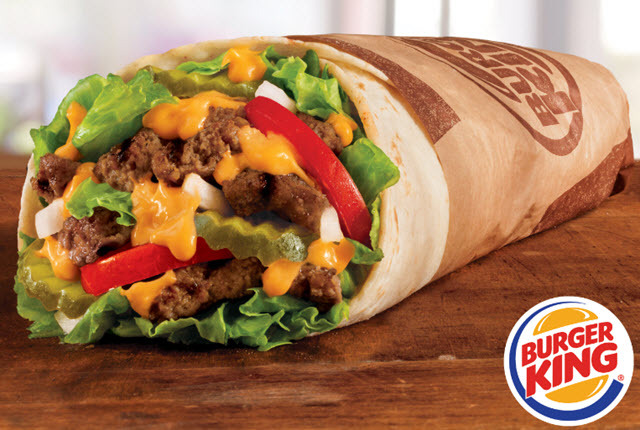 Burger King has combined its Whopper with a burrito for a new product called the Whopperrito. It is being tested at a Burger King restaurant in Pennsylvania. GrubGrade reports that the Burger King in Hermitage, PA is selling the Whopperrito. It is basically the ingredients found inside a Whopper (beef, cheese, tomatoes, lettuce, mayo, ketchup, pickles, and white onions) rolled up inside a flour tortilla. Test menu items often go to a wider release if they are popular. Mashable collected a few tweets from people who have tried it and the early reviews are not good. It is still early so there may also be people who have tried and it liked it. If it isn't a hit the Whopperrito may not go wide. Update 8-15-16: The Whopperrito must have been a success for BK because they officially took it nation wide today, August 15. Alex Macedo, President, North America Burger King says of the food merger, "We're infusing classic American fare with Tex-Mex flare." The Whopperrito follows the release of the less disturbing Whopper Dog.